Pasar Besar or wet market is the place we usually find fresh vege and meat. How often do we recall it as a place serving good local authentic food? Or shall I say food heaven?? 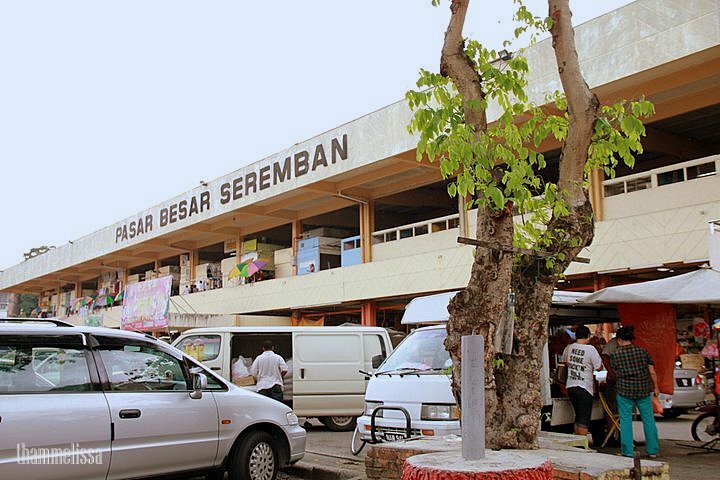 A place I would like to recommend here is Pasar Besar Seremban. The food stalls are located on 1st floor. Hence; there are few stalls that I would like to emphasize here because they are my favorite! Unfortunately, to find a parking here; is kinda testing your patience and luck especially during peak hours. (before 10am). However you wouldn’t want to be too late to arrive there(after 12pm) because some of the food may be sold out by then. Last Saturday, I made an effort to try them along with my mom & brother. The 3 of us were kinda like eating from 1 spot to another, sharing the serving all together so that we would be able to taste each of it. A family business which formerly runs by their father. There is another shop with same owner located at Jalan Kapitan Tam Yeong. Both shops are now operating by 2 brothers. The mee hoon is fried (not really deep fry), flooded with a brown color gravy then topped with braised pork slice, sotong(cuttlefish) and vegetable. I’m a big fans of ‘lou shu fun’. Therefore I mustn’t miss this. And if you are 1 of them too…I foresee you will surely like it too. 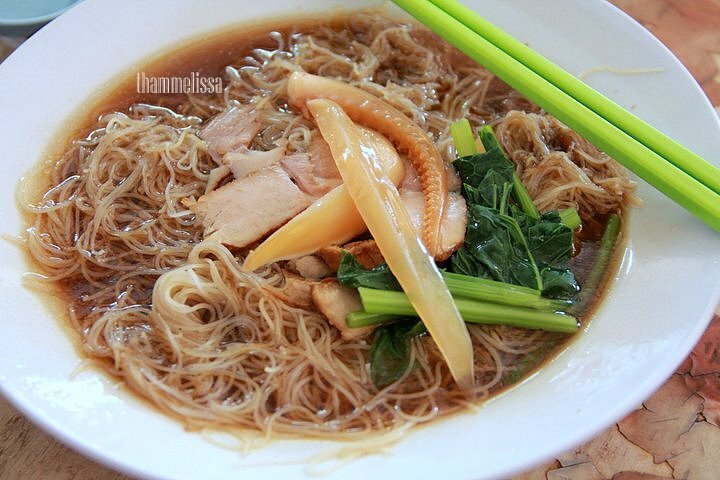 Another simple noodle, yet popular and taste good. Why do I said simple? 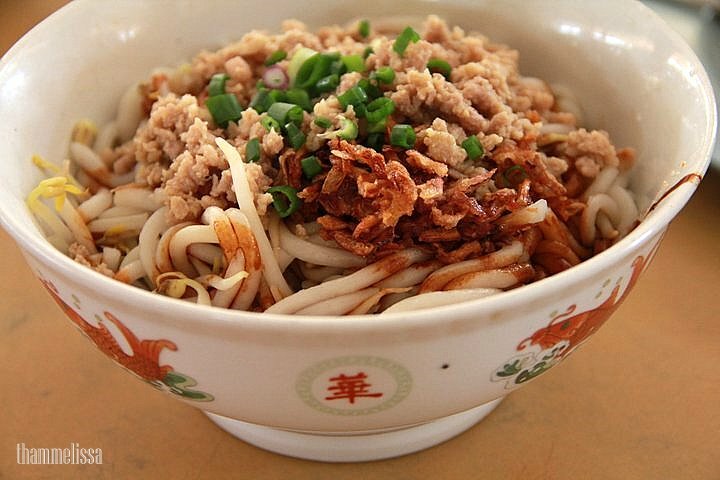 The lou shu fun just mix with some sauce (light soya sauce, dark soya sauce, oil) & topped with yummylious minced pork! 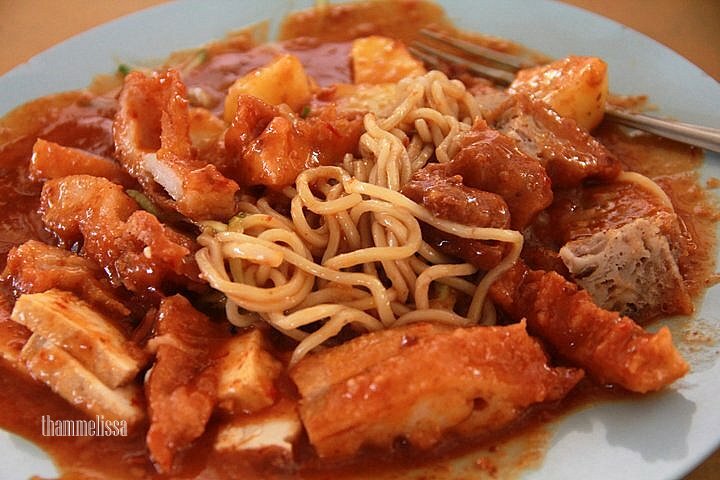 This mee rojak is similar to the mamak’s version. 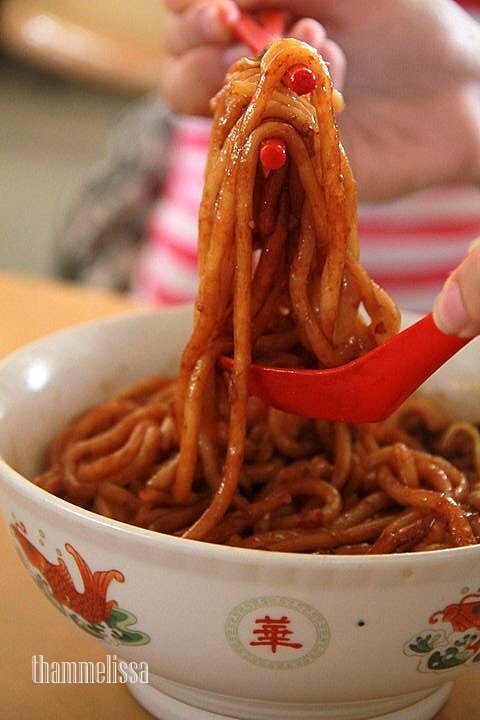 You may order without the ‘mee’ (yellow noodle). What’s hidden under the sauce?? Kuih udang, tofu, potatoes. I topped up an additional piece of keropok udang. The sauce is of sweet and sour taste. 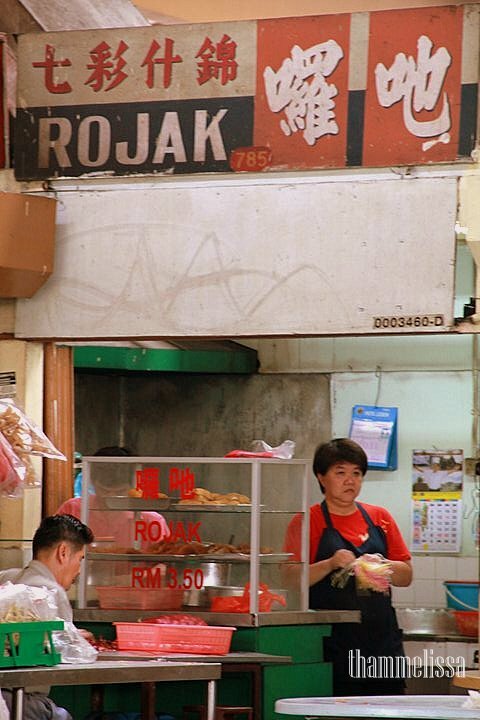 This plate of rojak is RM4.00. On a hot and sunny day; this is best to quench our thirst. Oh ya, the owner claimed this is his new creation of sugarcane. 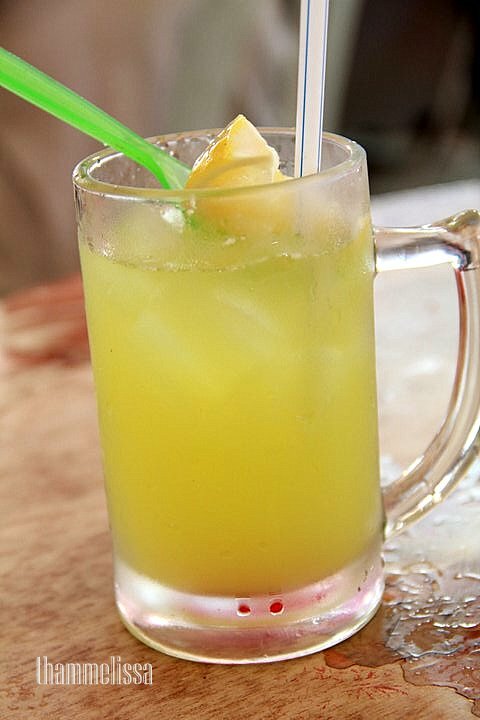 “Sugarcane Juice with Lemon”. *a sip through my drying throat* ehh…taste good leh… so refreshing and the sweetness is so natural. Moreover I saw the sugarcane was process only once. Unlike some traders who uses the same cane through the sugarcane processor for several times. 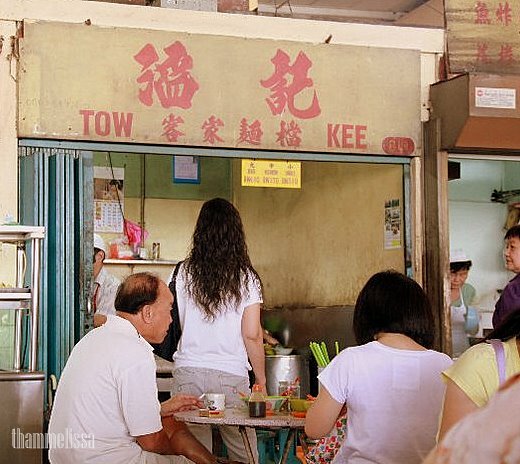 All the stalls above have been operating for many years. wah… so much you ate!! hahahaha….. 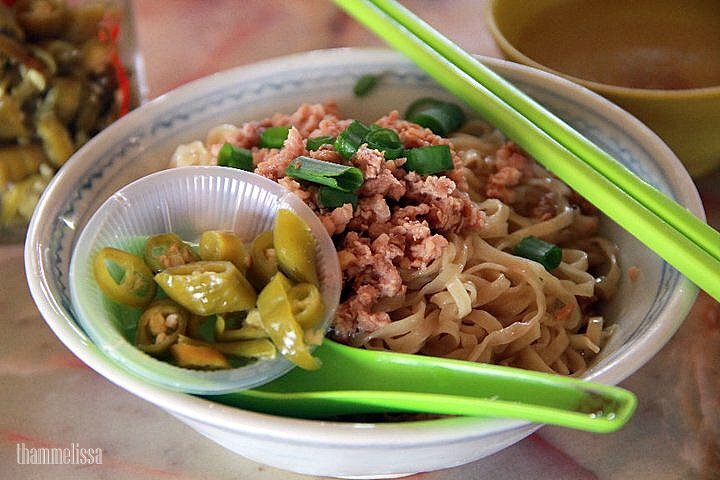 I miss the hakka noodles leh…..
Wow chilli padi the first time I see it again after 4 years, I miss it which reminds me to make my own. I cannot eat without those when I was in Malaysia. Haha…you sure do love the spicy-ness of it. Understand that it will be difficult to get over there. 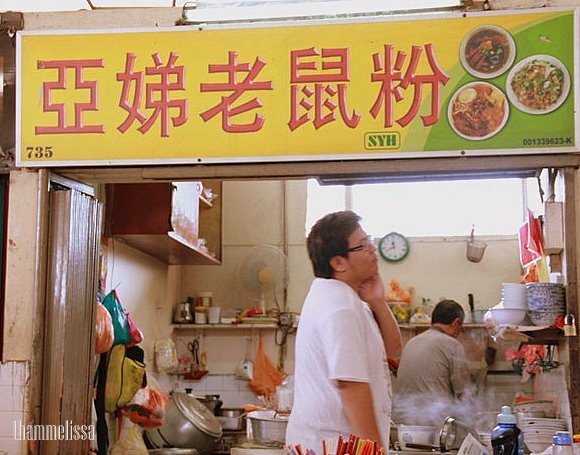 I have discovered and would like to share GOOD FOOD -the famous Kota Bharu, Kelantan Beef Noodles (Lim Siong Kee – about 36 years history) has travelled to PUCHONG (I have waited for more than 30 years for its arrival). 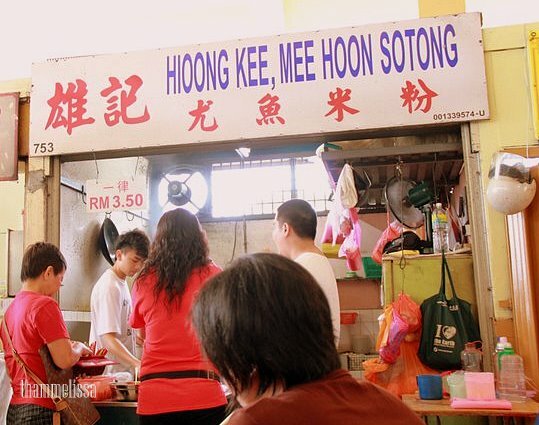 I had travelled all over Malaysia and this is the best Beef Noodles – (‘Ngau Lam Meen’) I have tasted in Malaysia – I will give 101%. Open daily from morning to lunch & closed on Sundays. I have taken it many times and I love it (no need to go back to KBharu). Usually that is the first food I go for when I go back to Kelantan and I will “Ta Pao” back to KL. You should go and try it.